Today, being New Year’s Day and all, was a rare Saturday off for Daddy D. No mail delivery due to the holiday. After a leisurely morning of staggered wake ups post family New Year’s Eve party, we headed out to do some shopping. We were blessed with many a gift cards last week and off we went to do some pickin and a choosin thanks to our friends and family. Minivan loaded with the brood we headed to our area mall. As in a fifty minute drive away. We visited Target and got some sweet 75% off Christmas decoration deals to stow away for next Christmas’ festivities. And we picked up some essentials. Oddly enough, Gabriel had been disappointed to not have new underpants for Christmas. I know. Weird request for a 6 year old? Right? But crisis averted with a enormous mega pack of Star Wars the Clone Wars undies. Nothing like slappin a pic of light saber wielding Jedi across your tuckus. After scurrying through Old Navy, Sears, AC Moore and the like we quickly stopped at Walmart. Daddy D had him a $20 gift card and he wanted a nuchuk. Now don’t get nervous. Daddy D is not a mailman by day and a stealth ninja by night. No, he is like most men in their early thirties, a gamer after the kiddos are nestled in bed. Apparently when one is playing those shoot em up games with the Wii special gun thingy (I am ohhh so interested in this, can’t you tell?) they would not like to disassemble said setup prior to kiddos playing their Wii games in the morning. Leading to the need for another Wii Nunchuk. So he bought one with the swipe of a nifty little gift card. Fast forward a few hours and we have arrived home. Said kiddos are nestled in said beds and down the stairs to the living room Daddy D scurried to unpack his new toy. The shopping bag was found. The box was opened and then Daddy D remarked with an unexpected word. Lotion? (a little bit louder now) LOTION? Seems that the lovely people at Walmart did not check their returns prior to restocking their items. Yep. Daddy D opened his beloved Wii Nunchuk box to find an exquisitely packaged travel size bottle of lotion. I’ve got to give the sneaky buggers some props though, finding a like weighted item to pack in the box to scam the Walmart people. Unfortunately those Walmart clerks did not catch said scam. Instead poor Daddy D was the proud owner of a twenty something dollar bottle of cheapo lotion. So Daddy D did what any above board consumer would. He called Walmart immediately and spoke with a manager. They said no problem, return to your local Walmart (13 miles away as opposed to 45), just give them a call first so they will be expecting you. Daddy D did call. And got caught in a ridiculous game of phone tag. Store #2 manager wanted to speak to Store #1 manager, call him back and tell him to call. This happened about four times. Finally Daddy D had had enough. Off to Store #2 he went. He arrived there and was told that although our local Walmart is open 24 hours, customer service was closed. Then when they went to get the manager he had spoken to on the phone, he was downright rude saying Daddy D hadn’t had the Store #1 manager call him. Daddy D proceeded to call from his phone in front of him, only to be hung up on by Store #1 staff. Then and only then did a Store #2 employee admit that Store #1 manager had called. 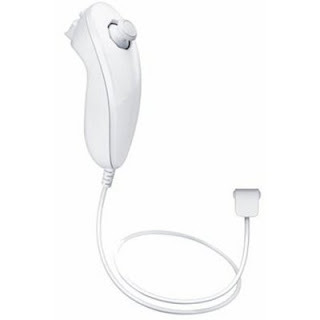 Finally they agreed to exchange the Lotion Nunchuk for one of the Wii variety. But not until Daddy D had to deal with two rather incompetent and downright disrespectful and rude managers for about two hours. Oh, and by exchange I mean they opened a customer service register, issued a refund gift card and then Daddy D had to go to the back of the store to the electronics department to purchase another Wii Nunchuk there. So to Walmart I say this…Please do your job and check the merchandise being returned to your store. If you do not, and another customer is on the receiving end of your failure to complete good business practices by restocking items that have no business being sold, please treat those customers with an iota of respect. They did not ask to spend their money on crap. They did not ask to spend hours of their time, make upwards of a dozen phone calls, drive an additional thirty miles round trip and be as upfront about the problem they encountered as possible. Your customers should not be expected nor required to do the managers job of calling back and forth repeatedly between stores. Especially when it is YOUR fault that they did not receive the product they paid for. Oh, and whenever your store is open it should be providing customer service. That is part of the gig of you know, running a business. I’m just sayin. Sincerely the D family, who are one Wii Nunchuk richer despite your best efforts. Oy vey – not surprising though. Wal-mart has great prices but their customer service leaves something to be desired. I can't believe no apology – they should have given him his money back and given him a free nunchuk.